Bel canto singing was a historical phenomenon which embraced Italian opera of the eighteenth and nineteenth centuries. It required infinite variety of sound, in particular a lyrical ecstacy, a faultless technique to dispatch the vocal pyrotechnics demanded of it, and earned itself eloquent praise as `the singing which is heard within the soul'. 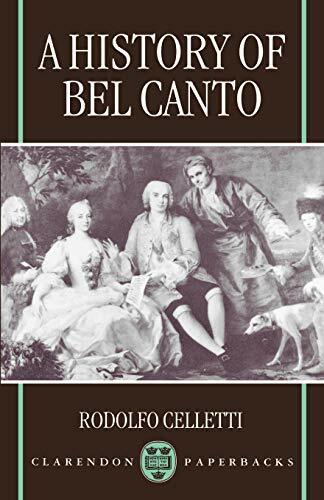 Rodolfo Celletti, who has devoted his whole career to studying the voice from every historical, technical, and musical aspect, offers here a fascinating history of bel canto singing and the voice in operatic literature. He begins by discussing the links of bel canto with the operatic ideals of the baroque, and points out that the style was created as much by operatic composers and their librettists as by their executants, the singers. To this end he undertakes a review of Italian opera of the period, andtraces the development of the style in different composers and their works. There is a chapetr on Castrati - the voice par excellence of bel canto - and the art of singing in their day. The final chapter looks at the history of bel canto since Rossini, charting its death and resurrection.